Many small businesses in North America have accused Yelp of a shakedown of sorts — offering, either directly or indirectly, to improve review listings if they pay for advertising. But Yelp denies the allegations and says its computer software decides which reviews make the cut. Her troubles with the hugely popular customer review website began about two years ago when she noticed a couple of negative reviews about her business were prominently featured. To make matters worse, she says, positive reviews about her company were hidden below in a "not currently recommended" category. Then she starting getting calls from a Yelp sales representative trying to convince her to pay to advertise on the site. She says she got the distinct impression from the salesperson that if she accepted, her problem would disappear: "What I got without spoken direct words is, 'Start paying, and we’ll find a way to get rid of the bad reviews.'" Kalnieva, who runs the small family company S & Sons Moving, refused to pay up. She believes Yelp continued to unfairly highlight her negative reviews, resulting in lost clients who got cold feet after reading them. "I felt helpless,” she says. Perhaps Kalnieva misread the situation. But she joins many small businesses in North America that have accused Yelp of a shakedown of sorts — implying in some way it can improve review listings for a price. Yelp is based in San Francisco, active in 29 countries, and boasts 139 million monthly visitors. Ephraim Dloomy says his Yelp saga began about six months after he opened his Toronto restaurant, Ba-Li Laffa, in June 2012. Like Kalnieva, he says negative reviews about his business were posted prominently while positive, five-star reviews were hidden in the not currently recommended section. Then he started getting frequent calls from a Yelp salesperson, trying to sell advertising. The restaurateur says the representative didn’t blatantly tell Dloomy he could solve his problem by paying up, but he believes that was the underlying message: "They said people who generally advertise with them end up having more stars. They implied it." Dloomy turned down the $350 a month advertising offer because he couldn’t afford it. Then he says his situation only got worse: "What I would notice is, I would get three to four positive [reviews] and a day later they would be gone," dumped in the hidden section. A furious Dloomy concludes, "Basically, I was being bullied into advertising." Over the past few years, the Better Business Bureau has dealt with numerous complaints about Yelp involving allegations about manipulated reviews that Yelp offers to fix if the business pays to advertise. One recent complainant went as far as to claim that "Yelp is trying to extort money from me … they are no different than the Mafia.” According to the Better Business Bureau, this issue has been resolved. Yelp is also facing a class action lawsuit filed on behalf of shareholders. It alleges the company misled investors about its business practices to boost share prices. 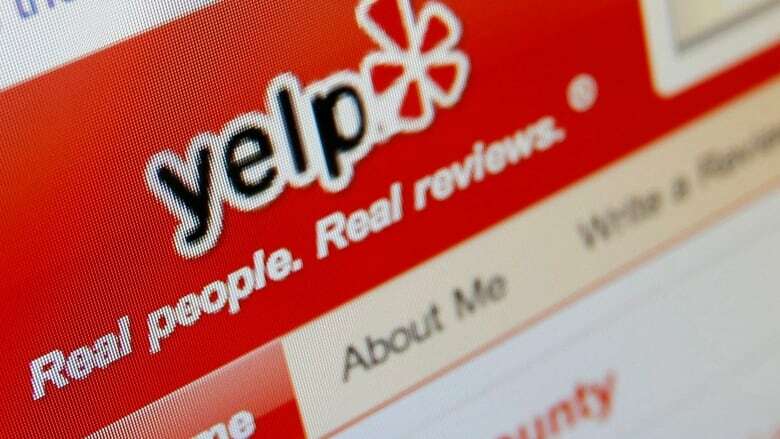 The suit filed this past August in the U.S. District Court in California claims Yelp posted unreliable reviews and offered to make negative ones go away if companies paid for advertising. The suit also notes that the company generates revenue primarily from ad sales. In a statement, Yelp told CBC News that the lawsuit's allegations "are without merit and we will vigorously contest them." The company also adamantly denies that businesses can pay to change their reviews or ratings: “There has never been any amount of money a business can pay Yelp to manipulate reviews and our automated recommendation software does not ‘punish’ businesses who don’t advertise." Yelp also points out that, so far, none of the allegations against the company have stuck. This past September, the Ninth U.S. Circuit Court of Appeals tossed out a lawsuit filed by several businesses accusing Yelp of extortion by trying to bully them into advertising. The court said the allegations could not be proven. The U.S. Federal Trade Commission received more than 2,000 consumer complaints about Yelp from 2008 to March 4, 2014. But according to a Yelp announcement last week, the FTC has closed its investigation without taking any action. The commission said it could not comment. So why do some businesses believe Yelp is posting reviews unfairly? The company says that its automated recommendation software weeds out reviews that might be biased or fake. For example, ones a business may have solicited from family to boost its profile. That explanation doesn’t sit well with NishiSood. She says she wrote a genuine, positive review for Swansea Massage Clinic in Toronto. But on Swansea’s Yelp site, it’s hidden in the not currently recommended section. “I wasn't even made aware that it got buried,” she says. Yelp explained that sometimes the software filters out genuine reviewers because it doesn’t have enough information. But if the person writes more reviews, he or she could earn Yelp’s trust. The co-owner of Swansea Massage, like others, complains of unjust review postings on Yelp. Beverly Gordon says that a few months ago the company approached her to buy advertising. But she claims the salesperson never implied he could manipulate her reviews: "They were very careful not to say that. They said they couldn't promise anything." Is Gordon misreading the situation? She says she’s paying to find out. So far, her review postings haven’t changed.